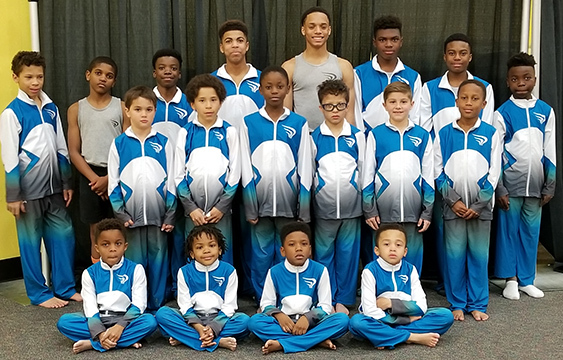 The Sportsplex USA Gymnastics Boys Gymnastics Team was established in 2006. Since its inception, the team has made a name for itself, winning State Championships. Gymnasts have been members of the State Team, National Junior Developmental Team and have competed at the Regional " National level. The Boys Team has current competitive teams from Level 4 through Level 10. Our team consists of both compulsory and optional gymnasts. Compulsory gymnastics is where each gymnast competes the same routine. Compulsory gymnastics is set up to have a steady progression of skills that start out from the basics and build until a gymnast reaches Level 7. Levels 8-10 are referred to as the optional gymnastics levels. Optional gymnastics has a set of guidelines at each level with specific requirements which are used to construct routines. Men's optional gymnastics uses OPEN scoring. OPEN scoring is the addition of the skills in the routine that the gymnast performs plus to the requirements and how well the gymnast performed the routine.